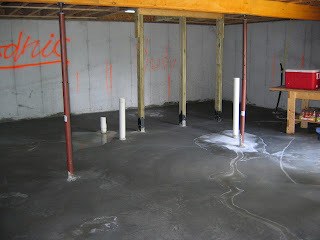 When I arrived on This past Friday I was pleased to see that the contractor have poured the concrete basement floor. 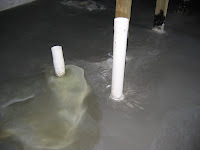 The basement floor is usually poured well after the roof is on and the building closed in. This is so the concrete is not rained on or otherwise compromised by materials destroying the nice finish the concrete contractor puts on the floor. It was kind of a nice feeling having the basement floor in - sort of a milestone of sorts... I could imagine what was to be built in the basement - two bedrooms, a workshop, bathroom and a laundry room, plus another living room area. The floor is given a nice smooth finish and the concrete sloped, ever so gradually towards the drains that I install earlier. There are two drains. Can you determine where they are in the above picture? A clue -- there are a few water marks that give it away. 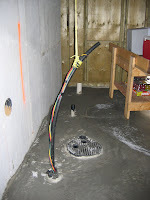 In a previous post (see "How to Make Sh#t Flow up Hill"") I described the process of putting in the plumbing under the basement floor. In the above and next two pictures you can see the almost finished product. The first picture at the left shows, starting in the foreground, the water intake from the lake (with the wires taped to it), the sewage basin, the shower drain and the toilet waste pipe. Of course these fixtures are not yet finished in that they need to be connected. each will have a specific adapter glued to it. For instance the toilet waste pipe will have something called a closet flange. In the picture to the left, you see, from left to right, one of two floor drains and the wastes and vent pipe that will be used to drain the laundry tub and the washer. The pictures don't quite do it justice but the floors are really smooth!